The time is now to travel to Europe. And if you can’t get there this Fall/Winter, you’ll want to secure your packages abroad as airfares are comparative to that of flying to the Caribbean, if not cheaper. Need some ideas as to where to go? Have you got a long weekend to jet set? Ireland might be the answer, or Paris or London. We truly don’t recommend any less than 3 nights in each city, if you choose to visit London/Paris, 4 nights in each would be better if you have the dough and the time. Most flights across the pond are red eyes, but if you can’t stand flying overnight, there’s non-stop service into London’s Heathrow, where you leave in the morning and arrive around 12 hours later (actually it’s only a little more than 6 hours to get there, but then you have to factor in the 6 hour time difference). For those shorter stays, we suggest you stay city center, but know that pricing will be higher. Depending on which sites you want to see, dead center isn’t necessary as typically it’s easy to get around these great cities. Another recommendation we constantly make is that if you’re visiting the destination for the first time ever, you consider purchasing a hop-on/hop-off bus tour. Don’t just get the one day pass, we recommend at least a two-day minimum. The first day use to acquaint yourself with what’s where and what interests you most. The 2nd day (it is a consecutive day pass), use the hop-on/hop-off to get where you need to go. Depending on the destination, the bus company might even include a walking tour or an illuminations tour (evening tour). You’ll be surprised at the difference seeing the city at night versus daylight. If you’re not a “bus person”, many of these destinations offer great Metro systems. Again depending where, there could be hop-on/hop-off river boats/ferries that can transfer you. Once you’ve decided on a destination, acquaint yourself with the excursions/tours you might be interested. Don’t be afraid of checking out those “off the beaten path” attractions too. Still confused? Give your friendly, trusted travel advisor a call. You won’t be surprised by how excited they are to assist with your travel arrangements. After all, a great travel advisor will have the resources to create an itinerary that will not only meet, but will beat your expectations. If you don’t already know a travel consultant, we recommend you not just call someone listed in Google (or elsewhere) and precede full steam ahead, but that you interview this person the same as you would when hiring an accountant, seeking out a reputable doctor or hiring a lawyer. Happy travels! Junglee Trips help you to explore some of the Natures beauty and help in experiencing Wildlife, like you might never did before with Best Dubai Packages from Delhi. Planning a vacation is fun, exciting, your reward for all your hard work, time away with family, and so forth. 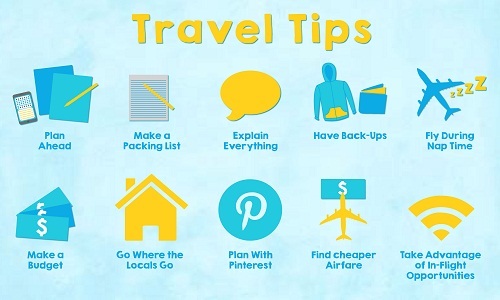 However, a vacation can still have its problems unless you follow some simple tips. Don’t get caught with hidden fees, extra costs you didn’t consider, airline issues, dirty lodgings, visiting destinations that don’t suit your wants and desires, and other travel nightmares. This article will help you watch out for problems that may arise while planning & taking your trip. Research is key. Whether you hire a travel agent or book online, you must know where you are going, what the area is like/if it offers what you’re looking for, where you want to stay, costs, where you can find information for tourists, and knowing how to book your trip to take advantage of every deal while not compromising your relaxation. Take care of things at home. Make sure you not only plan your ultimate vacation, but pack appropriately, have your home life well guarded, have all the proper documentation, know where your money is coming from & for what (be careful with credit cards), and your health and safety are a priority. There is a lot to consider before you leave and checklists come in handy to ensure you don’t forget anything and worry the whole trip. Make planning the trip fun and fit within your personality- plus get everyone involved. Getting Deals. There are many ways to find a good deal for your trip. There are also thousands of travel sites some of which offer excellent information, reviews, and deals. Many are good many are not. What we suggest you do is set your price range and find what you want to spend. Just make sure you know what you are getting into. Great prices don’t always mean horrible accommodations, but that depends on you. Plus a little negotiation on your part can get you upgrades and better accommodations, but you must ask. Other ways are to sign up for alert newsletters, look into clubs, check back at your favorite travel site frequently (i.e. you’ll find prices may drop or rise within a few hours), use auction sites to bid for low ball prices, and please, please read all terms and conditions. Asking around at forums and reading reviews can make the decision easier also. Another great tip is to be prepared with things to do while you wait in lines, long travel times, and down time. There will be plenty to do during the vacation, but when you travel to and from there can be delays, long road trips, and everyone has different likes. If you don’t have certain items, buy them or borrow them. Life will be much easier this way and your trip will be enjoyable. If you are not rich, like most of us, you’ll need a budget. Be realistic about your spending ability and if you have to say no, then do so. I know you only get a vacation every so often, but using credit cards or going into debt will only make life more stressful when you return. This may delay your ability to go on the next vacation. Doing things like eating in sometimes and eating out sometimes is good, limiting major & expensive attractions or shopping- do only the musts, & picking a destination that fits into your budget and allows for the most fun. Focus on the things you want to do and lay down ground rules before you leave. Thinking of having a budget especially for your trip stinks, but if you plan accordingly it doesn’t have to be a stress. We have had vacations where we spent very little money and had a better time than vacations when we spent a small fortune. Honestly, this is just a start. Using checklists will work wonders and making the whole process fun will take a huge weight off your shoulders, just be realistic. You’ll need to consider things like, where are we going, how are we getting there, where should we stay, what kinds of activities would we most like to do, what kind of money do we need to take, who will watch our home, what to pack, what special situations do we need to consider, where can we find the best deals, what travel tools do we need to take, how/what to pack, and more. There are sites out there dedicated to helping you have an excellent vacation so take advantage of them. Dubai was until recently not well known for tourism. How has Dubai managed to catch up with major tourism destinations such as Hawaii, Cannes or Bali? Other destinations have spent decades building up reputations and infrastructure with the hope of becoming a major travel destination. Dubai has managed to surprise all hospitality and tourism experts. These experts did not expect any destination and especially not one in the Middle East to become dominant player in the travel industry. So how did Dubai manage to build a beautiful oasis in the middle of the desert? Dubai started its rise to fame just over a decade ago with the launch of the first annual Dubai shopping festival. The local government decided to use this festival as a tool to promote Dubai as a holiday destination. The Dubai Sheikh and his sons spend years building an infrastructure and resort area for the tourism industry The Sheikh had learned from oil experts that the oil supply of Dubai could run out by as early as 2010. The leader of Dubai realized that the 2nd largest of 7 United Arab Emirates could not survive without the oil revenue. The Sheikh of Dubai therefore looked for alternative sources of income and came up with the vision of turning Dubai into a luxurious holiday destination as well as an important business centre .The Dubai rulers invested most of the oil revenue into tourism and this has lead to Dubai being a leading holiday and business destination. Dubai is superbly located geographically as it’s situated at a point where Europe, Africa and Asia meet. This has benefitted especially the MICE segment of the Dubai hotels and travel industry. MICE stand for the Meetings and Incentives branch of the tourism industry. Dubai has several world class facilities for trade shows and exhibitions including the ever so popular Dubai World Trade Centre. Practically every day some form of event or exhibition is held in Dubai which brings thousands of businessmen each day to this busy emirate. Large number of luxurious business hotels in Dubai caters exclusively for these visitors. Dubai is an excellent choice as a venue for meetings or trade shows as it’s ideally located for events which attract people from various continents. If one looks at the number of flights arriving daily at the Dubai airport and the vast size of the airport, it’s hard to imagine that Dubai only started an airline in 1985 while most countries have had airlines since early 1950’s. 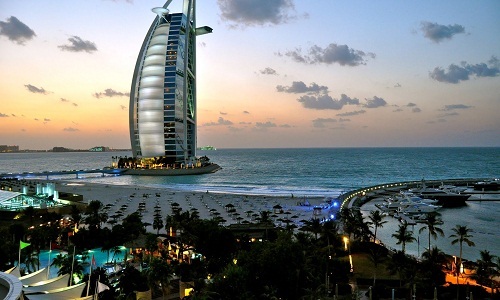 The Jumeirah beach area offers a select number of world class resorts such as the Burj Al Arab. The Dubai Burj Al Arab hotel must certainly be the most famous hotel in the world and its quality of service and its magnificent and luxurious facilities are unheard of in the hotel business. The other Dubai beach hotels are also of excellent quality and some are surprisingly affordable. The Dubai Hilton Beach hotel and the Jebel Ali resort for example offer great deals for families or visitors that can’t afford the rates at the Burj Al Arab but still would like to stay at a 5 star Dubai resort along the beach. Dubai has plenty of tourist attractions and activities for both the young and the old. An indoor ski piste was even created and opened its doors only a few months back. Other great Dubai activities are the Dubai desert safari’s by jeep, snowboarding on the sand dunes, playing 18 holes at one of the many world renowned golf courses or even just going shopping at the numerous shopping malls. Prices for many items are considerably cheaper then back home so do have a look as you will surely find a great deal. You should spend a few hours at one of the Dubai souk’s such as the Dubai gold souk. A visit is a great experience which should be done by anyone visiting Dubai. Don’t forget that you are expected to haggle about the price but always do it with a smile on your face! The nicest period of the year to travel to Dubai is from October until about April. During these months the weather in Dubai cools down so that it’s ideal for travelers. The weather in July or August is unbearable with many local residents even trying to get holiday so that they can take their family abroad to a place with more humane temperatures. 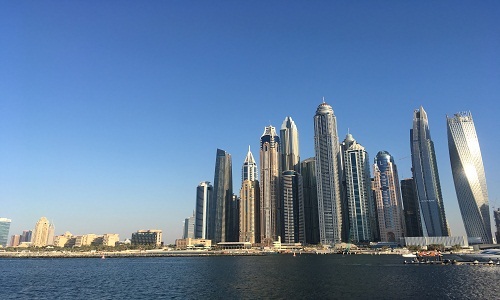 The trends so far do seem to suggest however that Dubai will have considerably more visitors this year for July and August than any previous year. Many Europeans are now choosing Dubai for their summer holiday destination as opposed to Jamaica or Cuba. The future of the Dubai tourism (Best Dubai Tour Packages from Delhi) industry just keeps getting brighter and brighter and there is no sign that the growth will slow down any time soon! Situated in the south-western tip of India, Kerala has found its mention in many acclaimed travel magazines and publications like National Geographic Traveler. A major reason that makes Kerala such a popular tour package is the accessibility – as any hot spot is only two to four hours away. Blessed with a moderate climate, the state has colorful festivals, sumptuous cuisine and various classical art forms to boast about. 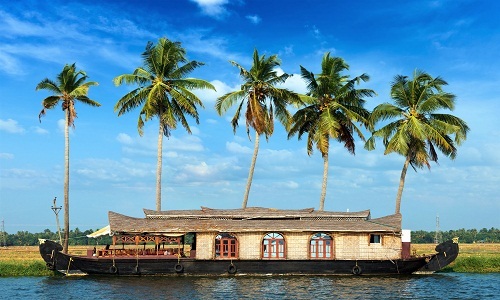 Kerala Houseboat rides or cruise on the tranquil backwaters are quite a romantic and relaxing getaway. These luxurious holiday homes can be found in Alapuzzha, Kottayam and Kuamarakom. Equipped with its own kitchen and bedrooms along with modern amenities, this is a great way to unwind while watching the soothing backwaters pass by. A few of India’s finest beaches are in Kerala. Kovalam, Cherai, Kappad and Bekal have been a favorite destinations, featured by Kerala Tourism Packages, for ages now due to their pristine sand and breath-taking coastline. A large section of visitors often indulge in the water sports on these beaches. Para sailing, jet sailing are a couple of the most preferred ones. If nothing else, beach bumming is the favorite past time, especially enjoying the art of doing nothing, while relaxing on the beach, sipping a drink. For the nature lovers, Kerala has a lot to offer. Eravikulam National Park, Wayanad Wildlife Sanctuary, Silent Valley National Park and Thattekkad Bird Sanctuary have an exotic variety of wildlife, birds and flora and fauna. There are trekking trails to be explored too. Vast plantations of cardamom, vanilla, tea, coffee and pepper also make a splendid sight. Kerala has a rich past and it is evident from the existing forts and ruins. Bekal, Padmanabhapuram Palace, Koyyikal Palace and many other forts and palaces must be visited to get a glimpse of its glorious history. Several museums have been set up to preserve the early eras and are open to public. Thenmala is India’s first planned eco-tourist site. Famous for its bio-diversity and unique vistas, Thenmala and Shenduruney Wildlife Sanctuaries at the foot of the Western Ghats, have overlapping resources and shared beauty. Children’s eco-park, dam, riverside treks and many other options available here ensure that you get a chance to be up, close and personal with the nature. Kottakkal is world renowned for its Ayurveda centres. The rejuvenating and invigorating ancient Ayurvedic therapies in Kerala are an ideal way to simply pamper you self. Special therapies are also done to help you overcome physical ailments and ensure a perfectly healthy body. Whatever your reason of visiting Kerala may be, this place is certain to enthrall you and leave you wanting for more. Explore Junglee Trips Tours and Travels and get best offer on Kerala Tour Packages and holiday Trip. Get customized Kerala Honeymoon Package at affordable price by Junglee trips.